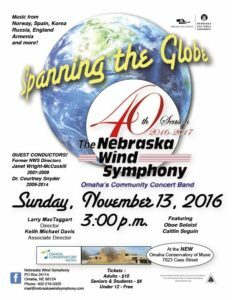 A celebration of 40 years of making wonderful music for the greater Omaha area since 1977. 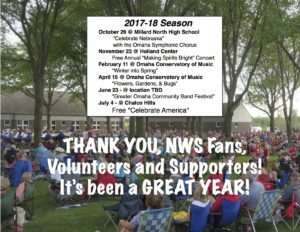 Selections included “Armenian Dances” by American composer Alfred Reed, “Valdres” by Norwegian composer Johannes Hanssen, “Variations on a Korean Folk Song” by John Barnes Chance, “African Dreams” by Brant Karrick, and others. 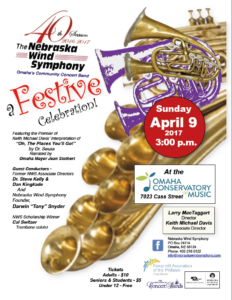 The concert featured an NWS brass quintet playing a new arrangement by Keith Michael Davis of Ralph Vaughan Williams’ “Folk Song Suite”. “Gabriel’s Oboe” by Ennio Morricone with oboe soloist, Caitlin Seguin was performed in memory of former NWS President and oboist, Marcia Regan. 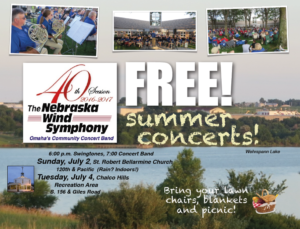 Admission: Free! Seating is first come, first served. Our 40th Anniversary celebration continued with music that reflects on our past and points us towards the future. This concert featured 12 Middle School All-Star Tubas on “Baby Elephant Walk” and “Tubas with Attitude”. Yarek Tereshchenko, violin soloist and faculty member at the Omaha Conservatory of Music, performed the haunting “Theme from Schindler’s List”. Brian Kracl, tuba, soloed on the “Jig” movement written in memory of Tom Sibbit from the “Friendship Suite”. We also welcomed back former Music Directors Dr. Timothy Yontz and Dr. Erica Neidlinger and Associate Director Chris Tucker as guest conductors. 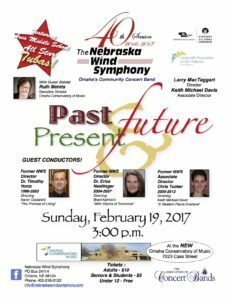 Our guest directors were founding music director, Tony Snyder, former associate directors Dr. Steve Kelly and Dan Kingkade. The 2017 NE Wind Symphony Memorial Scholarship winner, trombonist Cal Switzer, performed Arthur Pryor’s “Fantastic Polka” with the band. Special guest was Omaha Mayor Jean Stothert providing narration for Dr. Seuss’s “Oh, The Places You’ll Go”, a new work for band by NWS associate director, Keith Davis.